What a highly successful, centuries-old practice can teach the corporate world and how it can bring more meaning to one's career. In addition to his work as an entrepreneur, corporate executive, and consultant, for the last sixteen years August Turak worked alongside the Trappist monks of Mepkin Abbey, watching firsthand as they undertook new enterprises and sustained an incredibly successful business practice. Service and selflessness are at the heart of this 1,500-year-old monastic tradition's remarkable business success, an ancient though immensely relevant economic model that preserves what is positive and productive about capitalism while transcending its ethical limitations and internal contradictions. 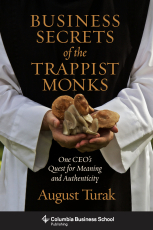 Combining the lessons he's learned from thirty years of business experience with intimate portraits of the monks at work, Turak shows how Trappist principles have been successfully applied in a variety of business settings. He demonstrates how the monks and such agnostics as Warren Buffett are wildly successful not despite their fanatical commitment to the highest principles but because of them. Turak also points to other "transformational organizations" that share critical components of the abbey's philosophy conducive to success.